Providing a single point of reference to all application clients when changing the license server configuration, or migrating to another license server. Applying restrictions on license usage according to specific users, IP ranges and time of day. This is applicable to all license manager types. The Router is implemented as a Java application. Java JRE 1.7 or higher is required. The Router’s configuration is set according to an XML file that should be set prior to running the application. The OpenLM Router receives a transaction on an IP within a specified range, and specific port number. It propagates it to a predefined destination IP, on a predefined port number. 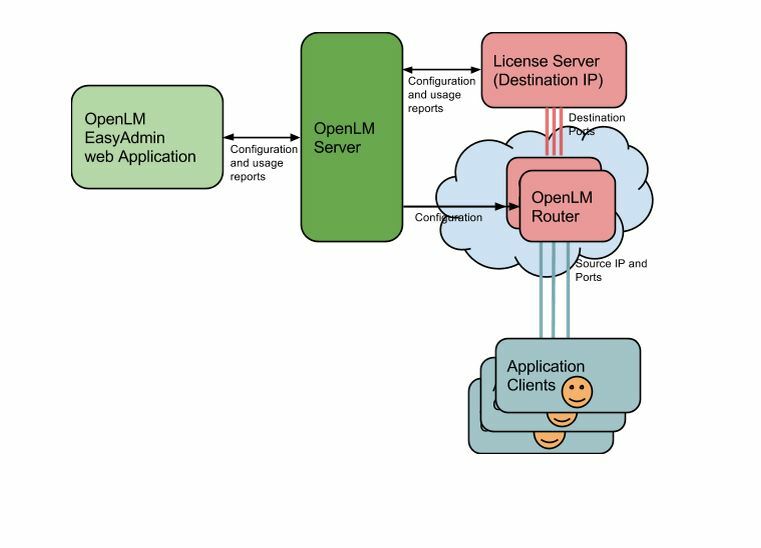 Since the OpenLM Router intervenes in the process of license requesting and granting, a back up is required in order to avoid licensing failure in case the OpenLM Router machine fails. A redundancy scheme is therefore supported; Two routers may be configured in parallel, thus backing up each other. Restrictions: Further rules and restrictions to license routing, e.g. : limitation of license granting to specific time of day.